Church Growth Modelling: Churches or Political Parties: Who has the Largest Membership? 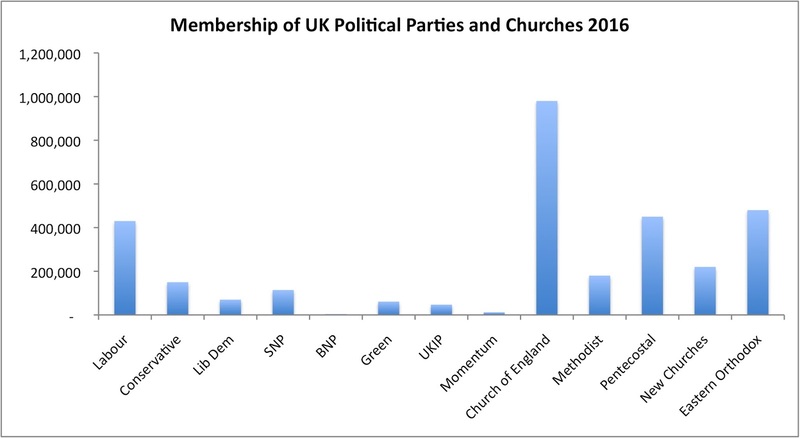 Churches or Political Parties: Who has the Largest Membership? I write much about the growth and decline of Christian churches, but given the political events in the UK following the EU referendum I thought I would compare church membership with political party membership to see who is the stronger. One result of the referendum has been a vote of no confidence in the Labour Party leader by most of his MPs, which was followed by a 60,000 increase in party membership in one week . In church terms that would be a massive revival! But what does it mean in political party terms? First, let me give a sense of the size of the main parties in the UK. 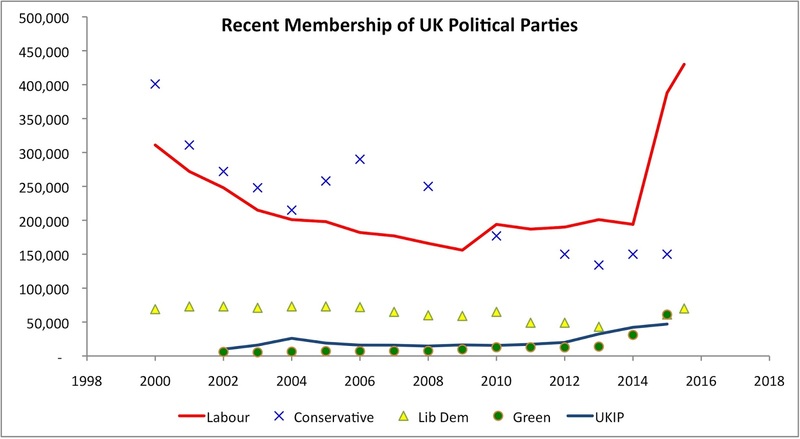 Figure 1 shows changes in party membership since 2000 where such data exists [2,3]. The membership of both the Labour and Conservative Parties have declined through the period, though both are significantly bigger than the other parties. Since the appointment of Jeremy Corbyn as their leader, the Labour Party has seen a significant membership rise to over 400,000, probably due to an imminent leadership election. Thus Labour easily has the largest membership in the UK, over 2.5 times that of the Conservatives, despite its relative lack of success in recent elections . Both the Liberal Democrats (Lib Dem) and Green Party have seen recent rises in membership, taking them past the 60,000 mark, well above the United Kingdom Independence Party (UKIP) on 47,000. There is little correlation between party size and electoral performance, or party size with the referendum result! Figure 2 compares the memberships of the Church of England and the Conservative Party since the 1940s . The Conservatives had a massive post-war recruitment campaign, but have since fallen from a peak of nearly 3 million to just 150,000 members. The Church of England by contrast has fallen far more slowly from 3 million to just under a million . Despite the well-publicised decline of the established church, it almost looks healthy compared with the Conservative Party! The Church of England were once nicknamed the “Conservative Party at prayer”. I doubt if that is a true description these days. From figure 2 it looks as if the Conservative Party better start praying again! 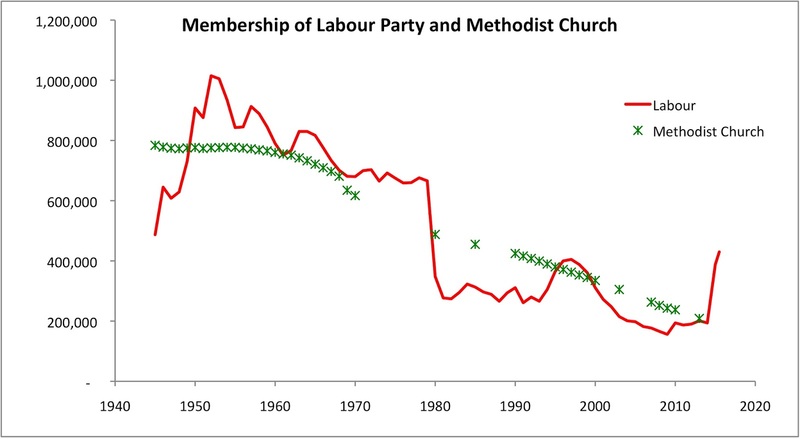 A similar pattern of decline is seen by comparing the Methodist Church with the Labour Party, figure 3. In this case the two almost match each other, though there is no obvious reason why this should be so. Both had just under 800,000 members in 1960, and both had about 200,000 in 2012. Unlike churches, most party members need to renew membership each year, thus they are more likely to disaffiliate if there are events that disturb them. Note the drop in Labour following its divisions and election loss in the late 1970s, a similar drop in the Conservatives in the early 1990s for similar reasons. Unlike churches, joining a political party does not require any participation at regular meetings. Churches meet every week and for some you have to make a public confession of faith before you join. That is a level of commitment I doubt many political parties would wish to introduce ! Thus political parties are much easier to join and leave and can be done so with little commitment. Note the rapid rise of both parties from 1945-1953. The recruitment campaigns behind this increase have similar dynamics to that of Christian revival. A research student of mine explained this rise with a similar model to the Limited Enthusiasm Model of church growth – word of mouth dynamics [3,8]. There is a similar revival in the Labour Party in the late 1990s (figure 3) when Tony Blair came to power. But the general trend of both mainstream parties is down. It is estimated that in these periods of political revival the majority of party members were completely inactive . Yes there are growing churches! As the mainline denominations decline other denominations are growing and taking some of the vacant space in the Christian landscape. 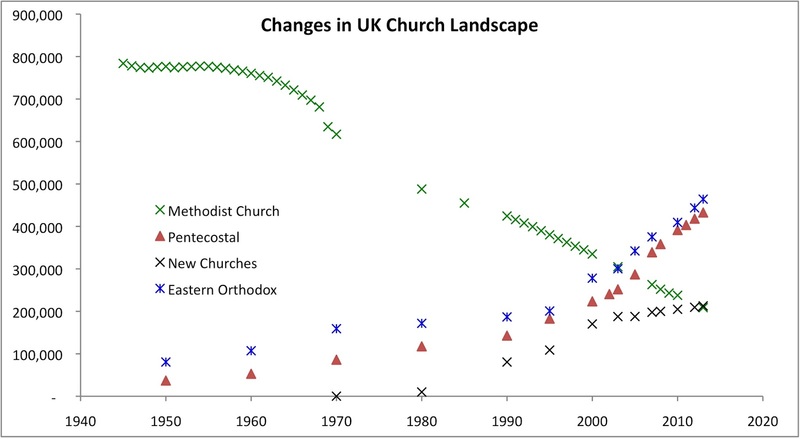 Figure 4 compares the decline of the Methodists with the growth of Pentecostalism, the Eastern Orthodox, and the “New” churches. The latter are independent charismatic churches, including New Frontiers and Vineyard, which came about as a result of the charismatic revival that started in the 1960-70s. Their growth has slowed of late, though not ceased, as many of these churches are in transition from the first generation of leadership. Notice both Pentecostals and the Eastern Orthodox have now passed the Methodist Church. Both are enhanced by immigration, the Orthodox being largely Greek. However there is strong revival growth in Pentecostalism as well. How does this growth compare with political parties? Figure 5 compares the sum of the revival churches, Pentecostals and “New”, with the Labour Party, and with the sum of the Lim Dems, UKIP, Greens and the Scottish National Party (SNP), all of whom boast of growth. 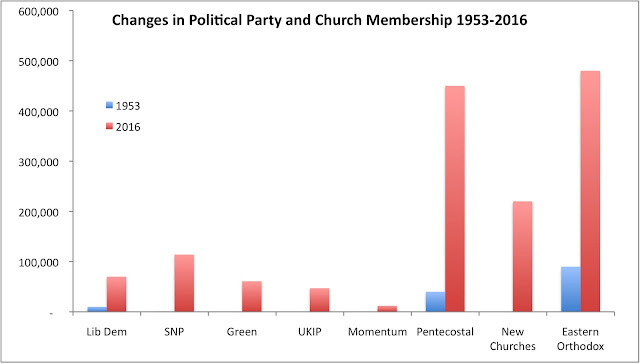 The revival churches are far larger than both political groupings; even with the recent surge in Labour membership. Just as important as the level of membership of the revival churches is the consistency of their growth, reflecting their long-term member commitment and regular meetings. We live in times where churches are scorned, secularism applauded, and political parties get much media attention for their growth. But from figure 5 it is clear that churches have a far healthier, and more sustainable, growth pattern. I could have added to their number all the independent evangelical churches, and all evangelical and charismatic churches in the mainstream denominations. Evangelical revival is dwarfing political party revival! Indeed Christianity has far greater membership than political parties. Figure 6 shows the state of play at this point in time in 2016. Of course church attendance is lower than membership, but political party activism is also much lower than their membership . Thus membership comparison between the two types of organisations is a fair measure of their relative strength. 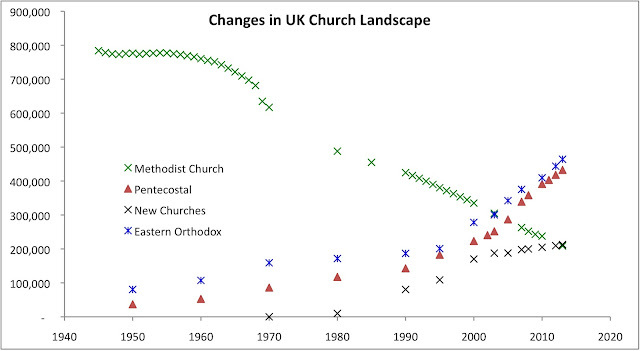 Despite its decline the established Church of England is by far the largest grouping, figure 6. By contrast the Conservatives, the party of government, are dwarfed by Pentecostals and the Eastern Orthodox. Lib Dems, Green and UKIP look tiny by comparison. Though note the SNP is significantly larger than other “small” parties despite drawing from the smaller base of Scotland. Proportionally the SNP is the most successful UK political party in membership terms at present. The largest political party is the Labour Party, figure 6, and it may well be even bigger by the time I post this blog as people are joining so fast! Nevertheless it is still only the same size as each of the Pentecostal and Eastern Orthodox churches. It is possible that once Labour has had its membership election it will decline again, perhaps forming two parties, due to disputes about leadership and direction. The British National Party (BNP), estimated at 4,200, cannot be seen on this scale, figure 6. Even the Momentum group, currently influencing the Labour Party, barely registers, even though it doubled from 6,000 to 12,000 recently . There is little correlation between party size and media coverage. If only churches could get the same positive media attention as Momentum and UKIP do! Well Jesus never went down well with the powers that be, so we Christians can’t really expect positive press! 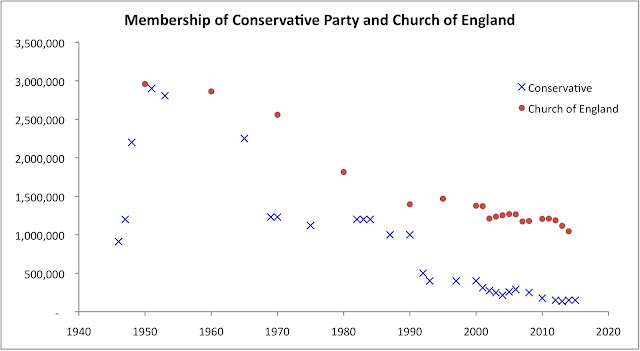 Even when it comes to change over time churches fare better than political parties, Figure 7 shows the Anglican Church falling less than the Conservatives over the last 60 years, as already noted . However the figure also shows the dramatic drop in participation of all organisations over this period. Why such a drop of involvement in voluntary organisations? There are probably many reasons; rising wealth is one. Most people now have both the money, and the time, to spend it on pleasure pursuits. That is an external reason. Another may be organisational atrophy, an internal reason. Older churches and mainstream political parties have become institutionalised. That is, they have large bureaucracies to maintain, and they occupy prominent positions in society. Such organisations lose the ability, and perhaps the will, to recruit to their cause. I have been modelling this with system dynamics, showing that most organisations have a lifecycle and find it very hard to survive without a serious dismantling of their institutional structures . Perhaps what we are seeing is the demise of the older political parties and churches, and the rise of new ones to replace them. 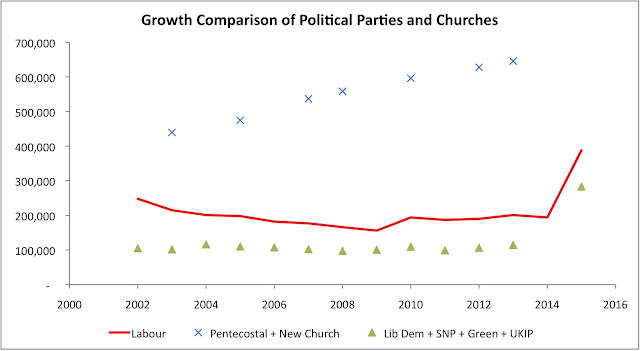 Figure 8 compares the growth of the newer parties with churches, showing that it is the Christian Church that is making a better job of this growth than its political counterparts. Rather than secularism taking hold, it looks as if Christianity is having a revival. Of course organisational membership is not the whole story. As I have previously written Christianity is losing out in the public space to a new ideology, which I named Diversity . It is humanist in belief and makes use of various single-issue movements, especially the diversity/inclusion/equality one, to pursue its cause. It has no party as such, but all political parties acknowledge it and promote it to some degree, as do some of the older church denominations. It is this battle where secularism is winning out over Christianity, driving churches to the margins of society, even though those churches are numerically healthier than political parties. So although Christianity can take some comfort that is having more success than political parties, with some churches having a measure of revival, it comes at a cost – public hostility. Not from all the public, not even from most of it, but the hostility of activists and their various elites in government, media, campaign groups and employment. However we can take comfort as Biblically we know true revival is given so we can face persecution, and through it, win many to Christ. Labour leader issues defiant message as pro-Corbyn organisation doubles its membership in a week, The Independent, 4/7/16. By the time I post the blog the Labour Party may have increased by over 100,000 members. 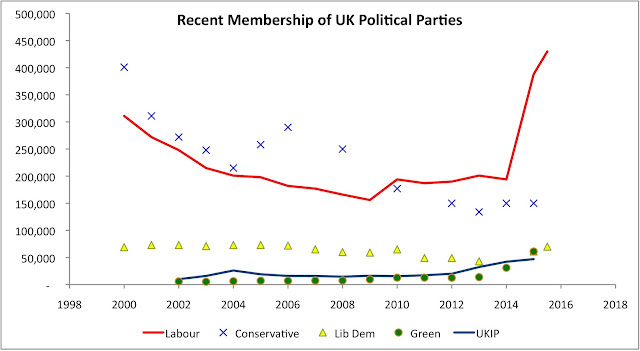 Membership of UK Political Parties, Richard Keen, House of Commons Library Briefing Paper SN05125, 11/8/15. Also previous versions: Keen (2014), McGuiness (2012), Marshall (2009). Figures for Labour Party membership are for full members. In addition Labour has affiliated members from Trade Unions, and registered supporters who may vote in leadership elections, but not in branch meetings. Membership figures for the Conservatives are limited, partly due to its organisational structure. Like most parties they are reluctant to release membership figures when they do not tell a good story. Religious Trends, Volumes 1-7, Peter Brierley, Christian Research (1991-2008). UK Church Statistics 2010-2020, Peter Brierley, Brierley Consultancy (2014). Churches and Churchgoers: Patterns of Church Growth in the British Isles since 1700. Currie, R., Gilbert, A. D., & Horsley, L. S. Oxford University Press, USA, (1977). Statistics For Mission. Various volumes from 2007-2014, Research and Statistics Department Archbishops' Council. Statistics for Mission. Various volumes. The Methodist Church. Churches are primarily about worship – thus are God-centred and have a sense of eternal destiny. Political parties are about events of this world and changing things in the near future. 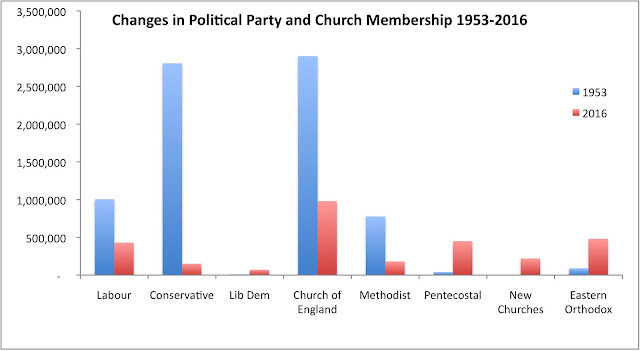 Those differences could make changes in party membership more volatile than that of churches. The Limited Enthusiasm model of church growth is explained in a number of publications, e.g. A General Model of Church Growth and Decline. Hayward J. Journal of Mathematical Sociology, 29(3), 177-207, (2005). The start figure of 1953 was chosen because it was a year where membership figures were known across all organisations. This was a very encouraging blog. With the politics going on either side of the Atlantic right now I think that it's important to pray and vote but know that no matter who is elected, God is on the throne. Our church, unlike most, asks members to reaffirm their membership every October. Those who don't get phone calls from the pastor to see why they are not renewing. It's a far more accurate impression of membership. Our numbers dropped slightly last year but that's okay, it's about God and not falsely inflated numbers. Annual recommitment, rededication, is an excellent scheme. I know some churches do this at the same time a vision statement for the year is given. It helps keep people onboard as partners. Normally I work with attendance rather than membership as a measure of commitment. But many churches either do not know, or do not publish this. Its equivalent in political parties would be difficult to get figures on, but anecdotally I know that many party branch meetings are in single figures, only a small fraction of party membership. Our parties may be in the state they are in because we have left them to so few people to run. I would even know where to start to apply it to your parties in the USA! We deliberately excluded them from the research project.